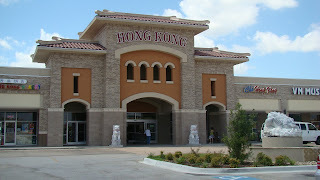 This is the Hong Kong Market located in Grand Prairie, Texas. This is where I usually grocery shop to buy Filipino foods and ingredients for my recipe. It is pretty neat inside, you will find different Asian cuisines such as Filipino, Chinese, Vietnamese, Korean and lot more. I love shopping here because aside from it's newly built shopping area for Asians, the stores are very organized. You'll find everything you need for your Asian recipes. Of course, they also sell fishes, sea food and meats. Choose the meat or fish that you like and they will cut and clean them for you the way you wanted them to be. Isn't that great? I'm glad, we live close to Asian stores.